The 15 Best Fall Activities across New Jersey! New Jersey is packed with a ton of opportunities for fun. Autumn is especially enjoyable as the weather cools down and the leaves change to fiery hues of red, yellow, and orange. With all the options for fun and recreation, it can be hard to choose between them all. Whether you prefer to trek outdoors or sit inside with hot cocoa, there is an activity for everyone. See below for a list that will help to narrow down the many choices. What better way is there to both enjoy the leaves and exercise than to hike? New Jersey is called the Garden State for a reason. There are a variety of parks and open spaces great for hiking all over the state from Mt. Tammany to Cheesequake State Park to Wells Mills County Park. The parks range in difficulty and terrain to suit any level of hiking. Pumpkins practically scream fall and picking your own pumpkin is the best feeling. The picking season lasts a while and there are many farms through the state. If you want to skip the picking, farms will usually have a batch available for sale right away. This event claims to exhibit 5,000 jack o' lanterns in one place and takes place in multiple states. For New Jersey, the event takes place at the Meadowlands Exposition Center. Maybe it will inspire a little bit of creativity for your own pumpkin carving. This is another activity that can and will end deliciously. Orchards all over New Jersey are ripe for apple picking with varieties such as Golden Delicious and Crispin. The apples are affordable too and give a chance to enjoy the crisp fall weather. Not all corn is for grilling with butter and eating. Corn mazes are enjoyable for the whole family to get lost for a couple hours and warm up with some cider and donuts after. Alongside apple picking and pumpkin picking, many farms offer hayrides through the day as part of the experience. Mosey on along in the back of the truck experiencing the farm life. And what kid doesn't dream to ride in the back of a truck at least once? Rollercoasters and zombies both in one place will excite anyone into thrills and adrenaline. That sounds like a way to celebrate Halloween and even extend the holiday. With a variety of events, Fright Fest provides more fun for the whole family. Feeling a little chilly? New Jersey has its own distinct set of wineries open to tours. A wine tour is nice adults-only option for those wanting a way to warm up and relax away from the little ones. This is also a good group activity for friends, family, and coworkers looking to spend time together. If you need a break from spending time outside, museums are a great option to take a break from the cold and learn. This applies to any season, but fall is an opportune time to check out new exhibits at galleries and museums. Some are small and historical like the American Labor Museum or art lovers can check out the Princeton University Art Museum. Some museums are free and have specials events for children and family. Haunted houses are an entertaining, fun way to scare the pants off of anyone you know. The spooky costumes and decorations can get anyone into the spirit of Halloween. Use it as an excuse for a date night or family night. There may be one at an old house or your local schools hosting a haunted house as a charity event. New Jersey has a number of its own small zoos to visit and see the animals. This is especially kid friendly, but not as crowded since summer crowds are no longer an issue. Check to see if there is a petting zoo near you. Yes, New Jersey has its own sporting events for sports enthusiasts! Go to a hockey game for the New Jersey Devils at the Prudential Center. There is also Giants Stadium to attend a football game to support our New York neighbor's team. The beach is always beautiful to visit especially areas such as Wildwood and Point Pleasant. Although fall is not a time to go in the water, the beach makes a nice getaway especially since it is free. Pack up a lunch and take some outdoor games. If you wake up early enough, the sunset is worth catching. 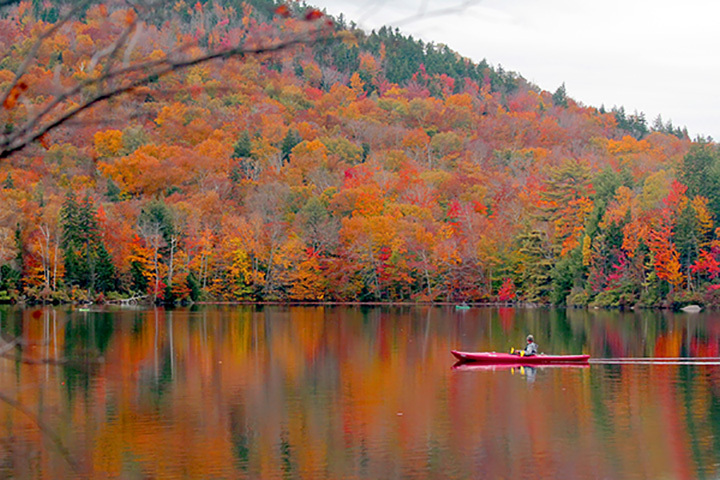 Taking a small canoe or kayak out is a relaxing way to enjoy the fall colors. This can be a bit of an arm workout but is worth the work to experience fall's views. It can be exciting in its own way depending how difficult of a waterway you choose to kayak in. Camping is great weekend getaway with many options. There are sites in New Jersey for camping with tents or rental cabins. They can include picnic areas, trails, lakes for fishing, or focus more on wilderness. Be prepared though as some locations may have more amenities than others such as outdoor bathrooms.